Charles Nagy is pitching in front of an aircraft carrier or battleship. It looks a lot like the one parked in San Diego bay. 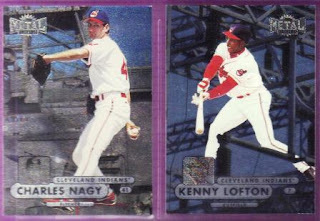 The one I walked around on instead of going to the conference like a good boy... And the last one in my collection is Kenny Lofton. He is batting atop some serious construction, with the bat inches away from one of those springy-things you See on some power poles... Man, let's hope he doesn't foul off in THAT direction! The players in the photos are very bright and colorful. Well, the pictures are, I can't vouch if the players are or not... The team name and player name are black-lettered in a silver oval, making it not quite difficult to read. I should have scanned the backs... The backs of the cards are all bright green and blue and purple with bright lettering, colorful photos... Oh, what the heck, see for yourself! Heavy metal! Bang your head! Awesome. I've never seen those cards, except the one you sent me.